Given Hollywood’s track record of late with big-budget disaster fare, it was really only for review purposes that I dropped Warner’s San Andreas disc into my UHD Blu-ray player and set it spinning. Imagine my surprise, then, when I found myself actually enjoying it. The plot is refreshingly simple: Ray Gaines (played by Dwayne Johnson, alias The Rock) is the commander of an LAFD helicopter rescue team, who excels at his job even as his personal life is falling apart. Ray’s ex-wife (Carla Gugino) is moving in with her rich new boyfriend (Ioan Gruffudd) and Ray’s teenaged daughter, Blake (with whom he’s always been close), is growing ever more independent. Because it’s always easier to root for a good guy in need of redemption, we learn that Ray’s family life fell apart because of his feelings of guilt over being unable to save the life of their other daughter during a rafting trip years before. Of course, this is a giant earthquake movie, so you can probably guess what Ray will have to do next. Paul Giamatti plays the requisite Caltech seismologist who predicts the Big One just as it’s about to happen. When it does strike, L.A. is hit hard and it’s Ray who flies to his ex-wife’s rescue. But Blake has just hitched a ride to San Francisco with Mom’s boyfriend (aboard his private jet). Would anyone care to guess where the next Big One will hit (and where Ray is soon to be headed)? San Andreas actually manages to work as a piece of glossy entertainment for three reasons: Johnson is likable, the film never takes itself seriously, and it adheres to the “KISS” method of visual effects filmmaking… Keep It Simple, Stupid. It keeps its focus on how the disaster impacts a single family, breaking away from them only for occasional bits of exposition. Yes, it’s as predictable as the clock tower in the old town square, but that’s okay because playing Disaster Movie Bingo while you watch it is half the fun. My wife and I spent the movie taking turns predicting what was about to happen next and, when it inevitably did, we both got a good laugh out of it. Best of all, the film delivers all the requisite digital spectacle and Giamatti tosses in just enough science(ish), with perfect “disaster face” expressions, to make it all seem plausible… even when you know, deep down, it’s actually completely ridiculous. Warner’s Ultra HD Blu-ray presents San Andreas in 4K (2160p) at a 2.40:1 aspect ratio. The film was lensed by cinematographer Steve Yedlin in ARRI Raw format using “open gate mode” (3.4K resolution) with Arri Alexa XT cameras. Post production and effects work was done in 2K, with the film delivered for theatrical release via 2K DI. It appears that Warner’s UHD presentation was simply upconverted from this 2K source and then HDR color grading was done in the 4K space. As with other UHD titles that have been upconverted from 2K, there’s somewhat more fine detail visible in the image here, though not as much as you’d expect from native 4K or higher source material. Of course, as was the case with Warner’s Mad Max: Fury Road UHD release, there’s also a great deal more noise visible in the image. This likely started as applied grain texture (to lend the digital image the look of physical film) but it’s become more pronounced as a result of the upconversion process. There’s also a degree of what appears to be a kind of flutter in portions of the image that have less detail. It’s particularly visible in medium-bright sky backgrounds and may be a result of the H.265/HEVC codec struggling to process this noise amid the lack of actual image detail. I didn’t see it on Fox’s The Martian (also a 2K upconvert) or Sony’s Chappie (a full 4K title) but it was noticeable on Fury Road and Fox’s Exodus: Gods and Kings, both upconverted from 2K, so it seems to be a relatively common issue with early UHD titles. The benefits of High Dynamic Range are certainly obvious here contrast-wise, with glare and reflections taking on a more visually intense quality and shadows and darker areas appearing deeper and yet still detailed. Of all the UHD titles I’ve reviewed thus far, however, San Andreas seems to benefit least from HDR’s enhanced 10-bit color depth. The overall palette in this film is generally more subdued, or at least more ‘normal’ compared to a title like Fury Road, though you do see the occasional enhancement – for example the bright red markings on Ray’s Bell 412 helicopter. Audio-wise, this UHD disc offers the film’s original English soundtrack in a Dolby Atmos mix that’s compatible with 7.1 Dolby TrueHD. It’s a thrilling and enveloping sound experience, with incredibly precise imaging, and terrific dynamic range. There’s intense bass reinforcement in the .LFE channels, and sonic detail wraps and moves around you with clever panning effects that completely envelop you in the film experience. The Atmos ‘height’ channels are used with particular effectiveness in the downtown L.A. rescue sequence, as skyscrapers begin to collapse all around. Audio is also available in 5.1 Dolby Digital in English Descriptive Audio, French, German, and Spanish. Optional subtitles are included in English SDH, French, German (für Hörgeschädigte, which means for the hearing impaired), Spanish, and Portuguese. Warner’s UHD menu interface is virtually identical to their recent simplified Blu-ray menus. 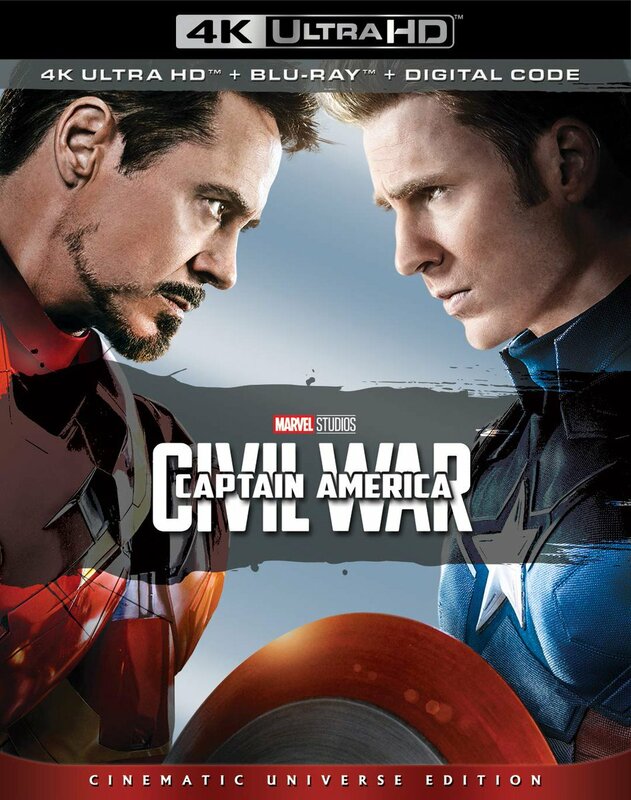 As with other early titles, there are no special features on the Ultra HD disc itself, however the packaging includes a copy of the previous Blu-ray edition. This gives you audio commentary with director Brad Peyton, 3 featurettes (San Andreas: The Real Fault Line – 6:23, Dwayne Johnson to the Rescue – 9:24, and Scoring the Quake – 6:13), a few Deleted Scenes (4:40), a Gag Reel (1:23), and a Stunt Reel (2:55). It’s not much, but it’s certainly enough for this film. The packaging also includes a paper slip with a Digital Copy code, but does not include the Blu-ray 3D version of the film. San Andreas isn’t likely to make anyone’s Ten Best lists but I enjoyed it nonetheless. Warner’s 4K Ultra HD release is decent, and offers modest image improvements over the previous Blu-ray edition, but only the audio presentation really shines. If you’re searching for UHD reference titles, I’d recommend that you look elsewhere first.